Hello friends, I think many of you know who Paloma is and perhaps you have been following her journey across the continents. After the shock, the anger, the nausea ... what to say, what to do?I have only weapons made of paper and words ... 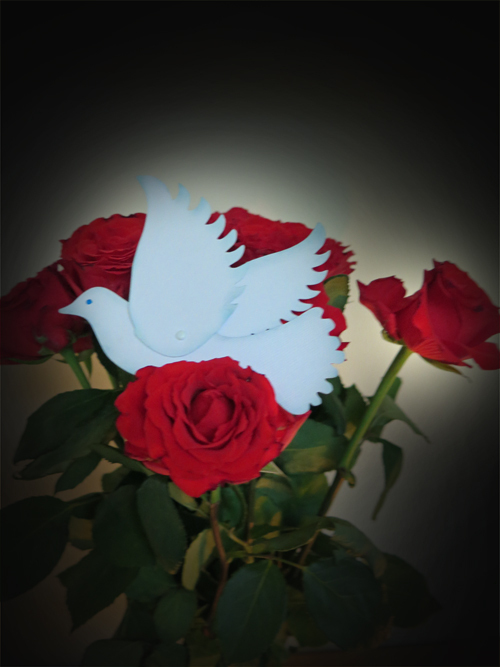 I can face violence only with my values ​​and beliefs.Freedom and peace are the ones I Wished to give today.So this is Paloma, my little dove single paper. Since then Paloma has been travelling the globe and carrying with her the message of peace and love between crafters. A few days ago she landed on my doorstep. She had come from Ireland and arrived in a huge parcel full of crafty gifts from Shirley. Thanks so much for all those goodies Shirley!!! Unfortunately, somehow on her journey between Ireland and Scotland a little blue book that had been travelling with her got lost. This little book contained the names and addresses of all the people that signed up to photograph her along the way. When neither I nor Shirley could find this little book, I contacted Lys, but sadly she has no full list of people that had said they wanted to be part of this message of peace.... So what to do? If you would like to be part of Paloma's journey, - please leave a comment on this post and contact me with your name and address and I will put a new booklet together, to travel along with her. You can reach me by clicking the contact me button in my side bar. Well to finish this long post, here is a card, featuring Paloma's journey of peace, it will go to whoever contacts me first. Please spread the word!! I drew a dove roughly too the same shape of the original Paloma. 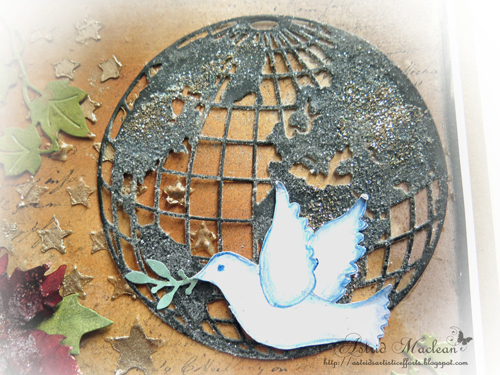 Created a background with inks, added some texture with the help of transparent texture past and then put my little Paloma in front of the lovely Tim Holtz globe die. 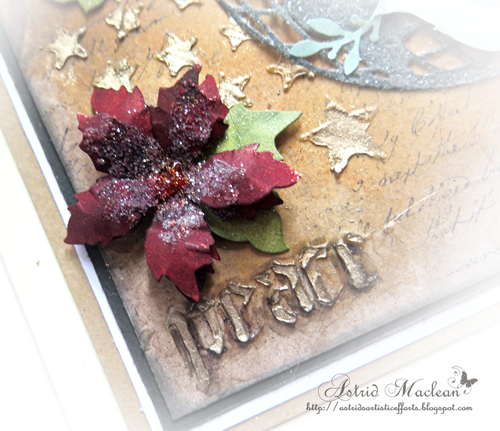 A few die cut embellishments and a poinsettia created with another of Tim's dies, finished off my card. And here is the card together with the actual Paloma, I very much hope she can soon be on her way again!! If you want to see where Paloma has been so far already, just click here. And if you were on the original list but have not yet received her, or indeed if you would like to be part of this journey, - PLEASE BE IN TOUCH!!! Thank you for your visit like alway and may peace reign on earth one day in the future!!! Such a special journey for Paloma. The places she visits and the sites she sees on her worldwide flight is inspiring to say the least. We really are all one on this planet and it is so nice to be reminded of that in a hands-on wy. I would love to take part in this adventure Astrid. What a beautiful thought - bringing peace into life of different people (culturally, religiously etc.) with Paloma! And your card, Astrid, is just fabulous! Bon voyage, Paloma! Thanks so much Astrid for hosting Paloma and setting her among these beautiful roses! The card you made is gorgeous, little Paloma's sister is a very nice gift. I hope Paloma will go on her worldwide journey with the new address booklet you'll make. A lovely post Astrid and what a shame about the little book, I remember Paloma arriving with Shirley and it's a lovely card you have created as well. A very beautiful Paloma offering Astrid and such a shame that the book went missing along the way. Oh how sad that her little passport has been lost! From memory Astrid, Nicola of Paper Profusion was on the list, but I cannot remember any more, I have Nicola's address if you would like to send her there. Sorry that the booklet got lost - but good that her journey continues! A really beautiful card Astrid! How sad news that the little book with all the names and addresses has been lost!! Especially as it would have made a great little treasured keepsake for Lys at the end.. I hope you will be able to make another one Astrid?.. Apart that, I love your card, just exquisite and fabulous!!! 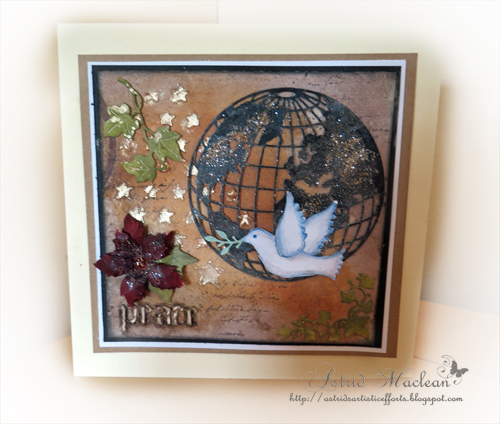 A gorgeous card you created to follow Paloma on her next tour, around the world, Astrid.The globe is the perfect background for her, and the poinsettia so stunning. Have a peaceful, and wonderful journey ,and lets all hope for more love between every one !! It´s an absolut gorgeous card, and I love the story behind it too. Sorry to hear, that the little book went astray, but unfortunately too much does in the mail these days. It´s really hard to join in on anything these days, as way too often, then sent cards and stuff never get to the reciever. I think I´ve lost not less than 6 different cards and one gift this year, so I must confess, I´ve given uop to participate in anything anymore because of that, but with the expensive åpostage and then soo much goes missing and we have to replace it time after time, it´s simply too expensive. It´s really sad but not much we can do about, as it seems the post people doesn´t seem to care a bit atr least here they don´t. A lovely post to read and your card is beautiful. I hope Paloma continues her journey safely. I love this card! So beautiful! 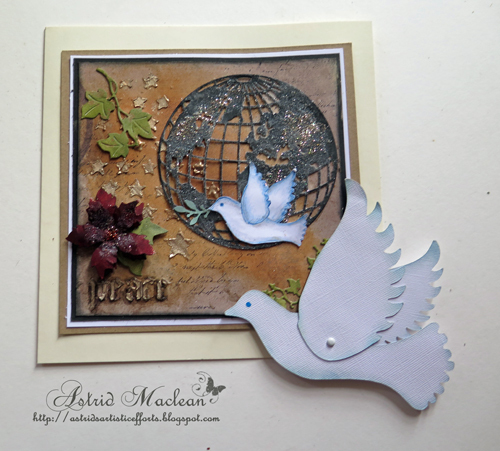 What a beautiful card Astrid!Perfect design and elements! and how thoughtful to make a new book of the original that was lost- however did it get separated from Paloma?! Well, happy to here she will be on the way again-wishing her safe travels, on the wings of a dove! 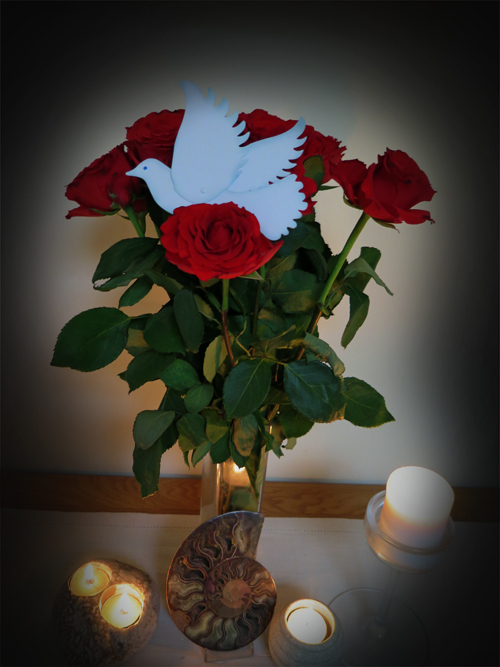 Lovely to see Paloma alighting on her candlelit rose shrine to peace, and your tiny Paloma perched on the fabulous festive card is just wonderful. So sorry to hear the book has gone missing... I'm afraid it's so long since I was filling it out that I can't remember who was in it. Most of the ones which spring to mind have already had a visit. I'll go back to my original Paloma post and see if I can find any other clues. Destination Inspiration for a Vintage Journey.